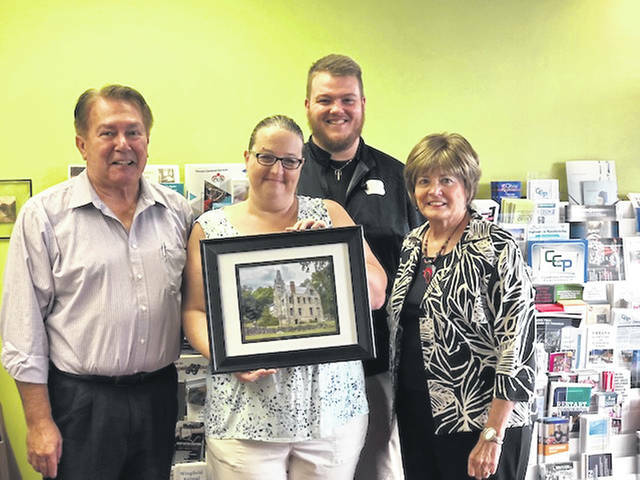 From left are Elton Cultice, Visitors Bureau committee member; Mandy Davis holding her winning photo; Adam Moore, Visitors Bureau committee member; and Sandy Gonzalez, Visitors Bureau committee member. The Champaign County Chamber of Commerce & Visitors Bureau held a photo contest over a period of approximately six weeks, with the hope of receiving photos for the chamber’s 2019/2020 Community Member guide, its website and marketing photos for events throughout the year. The chamber reports that several photos were entered and that the decision was difficult for the Visitors Bureau Committee, which selected a photo of a Piatt Castle, a popular attraction to those near and far. The Piatt Castle photo was submitted by Mandy Davis, who started taking photos of her son in sporting events, then expanded to other subjects. She quickly found she enjoyed taking photos of different landscapes, animals and other people. She submitted several photos to the contest and received $100 for her winning photo. The chamber expressed appreciation to all who entered photos.